“Much have I travelled in the realms of gold…. Good morning, at least they call this the morning shift. Even though we have a few days before we reach our site, It is good for us to get used to our 12 hours shifts. Half of us work the midnight to noon shift, while the other half work noon to midnight. Its kind of a bummer to think that I wont see half of the group anymore. It is now only 1AM – It’s still dark out, but at least it will rise about 4am. It is also a bummer to eat breakfast at midnight, and lunch when the kitchen is serving breakfast. Dinner at lunch time usually works out fine. There are many options for every meal. So there is always something to eat… you can always order eggs – but pancakes are only served at 6am. Today I had raisin bran and toast for Breakfast. 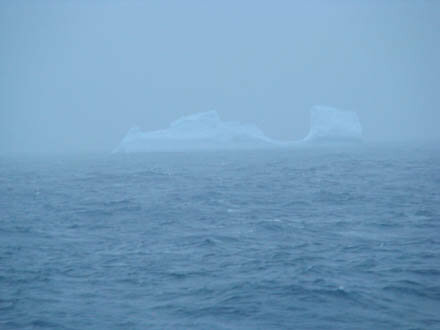 Just my luck, just as the sun was coming up, we spotted our first iceberg off the port side. This is my first iceberg ever. There was something very majestic about it. It was a bit cold outside, but not too cold with my winter coat. Going out there to take this picture definitely woke me up. I’m glad the storms that we experienced the previous days have died down. Before today we had high seas – and the ship actually took a 13 degree roll at one point. I don’t like going outside those days because they are too windy and too wet. It is good to know that I don’t get sea sick though! The captain let me go onto the bridge the other day when it the seas were rough. The waves were so big that they were slashing the bridge windows! Crazy! See – glad I wasn’t outside for that. Now I plan to spend the rest of the day practicing staining slides to look for bacteria. Things are looking promising. Here is a pictures of my working space. I have a window, a lab bench, an autoclave (that big thing – I use it to sterilize my tools so I don’t contaminate anything), a microscope and a computer. The lower picture of my friend James who is the organic geochemist. I helped (…watched…same thing) him set up his chemistry hood. He’s going to do lipid extractions onboard (doesn’t that sound fun).